There are so many beautiful hikes in this area, it's almost overwhelming. We used to be out exploring way more often when we had a dog and, not surprisingly, we've continued to get lazier since our daughter came along. 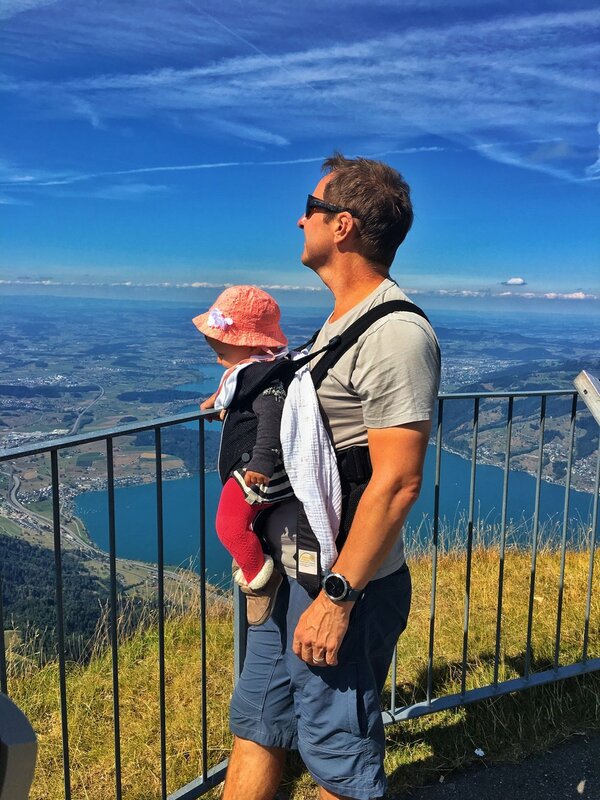 So yesterday we decided to take Baby on her first real mountain hike to get us moving and escape the heat. We drove to Vitznau, which is on the other side of Lake Luzern (Vierwaldstättersee). As expected, we turned around within 2 minutes, since lately car rides seem to get Baby's bowels moving and it was easier to change a poopy diaper at home. 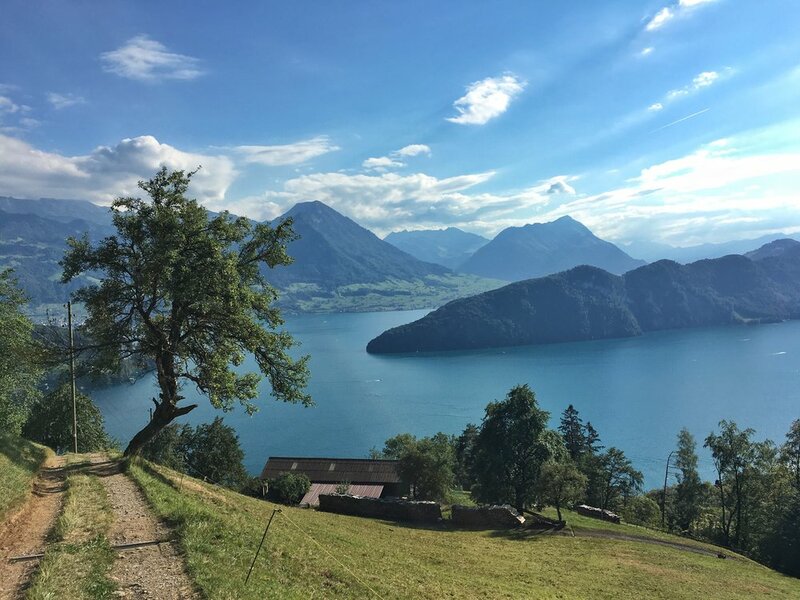 However, once we were back on the road, it was a lovely 35-minute scenic drive along the lake to Vitznau - seriously it is so beautiful and you immediately feel like you're on vacation somewhere exotic. From Vitznau, we took the cogwheel mountain train to the top of Mt. Rigi (Rigi-Kulm: elevation 1797 meters / 5895 feet). The historic train carriages are from the late 1800s, adding to the charm. Plus the views are amazing! 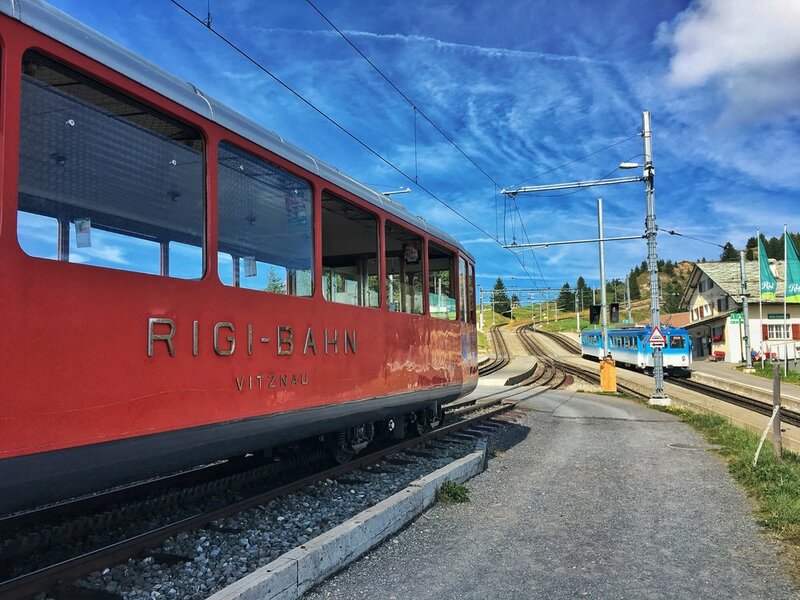 You can also get off the train at several stops along the mountain, including the Rigi Kaltbad spa about 3/4 of the way to the top. At the top, there are some restaurants and hotels, but just wandering around and capturing the panorama views from all angles is enough. On a clear day, you can see 13 lakes and endless mountain peaks. Temperatures are also a bit cooler at that elevation. With the sun shining, it was perfect after the crazy hot summer we've been having this year in Switzerland. We fed Baby, had our obligatory Kaffee and Kuchen (coffee and cake) and then began the hike down. It took us just under 3 hours to do the 9km (5.7 mile) hike back down to Vitznau. It was steeper than I remembered, with some areas of loose gravel, but there is a decent path the entire way. And we managed with Baby in the carrier no problem. We did stop numerous times to take photos and once for a nursing/diaper change break. It really is one of those hikes where the views just kept getting better - the mountains and lakes are breath-taking. The hillsides are covered in grazing cows, so Baby was lulled to sleep by the sound of cowbells. At one point we even had to step off the main path, since a herd of cows was also using the path and heading straight for us. 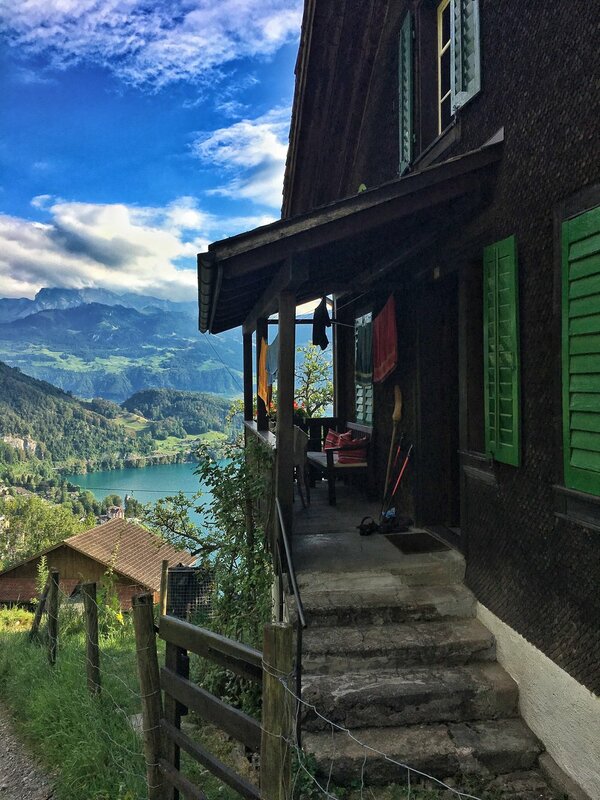 Along most mountain paths, you'll also pass a few Swiss chalet-style huts serving beers and snacks. Additionally, we passed not one, but two "Tee Pause" stops. At first I thought they were lemonade stands (if we were in the US, it would have been! ), but these were tables set outside farm houses with big pots of tea, made with fresh mountain herbs. As with most Swiss mountain farm shops, there was an honesty box, where you could leave a few coins to pay for your refreshment. So Swiss! By the time we reached the bottom of the mountain, it was already nearly Baby's bedtime, so we drove straight home. 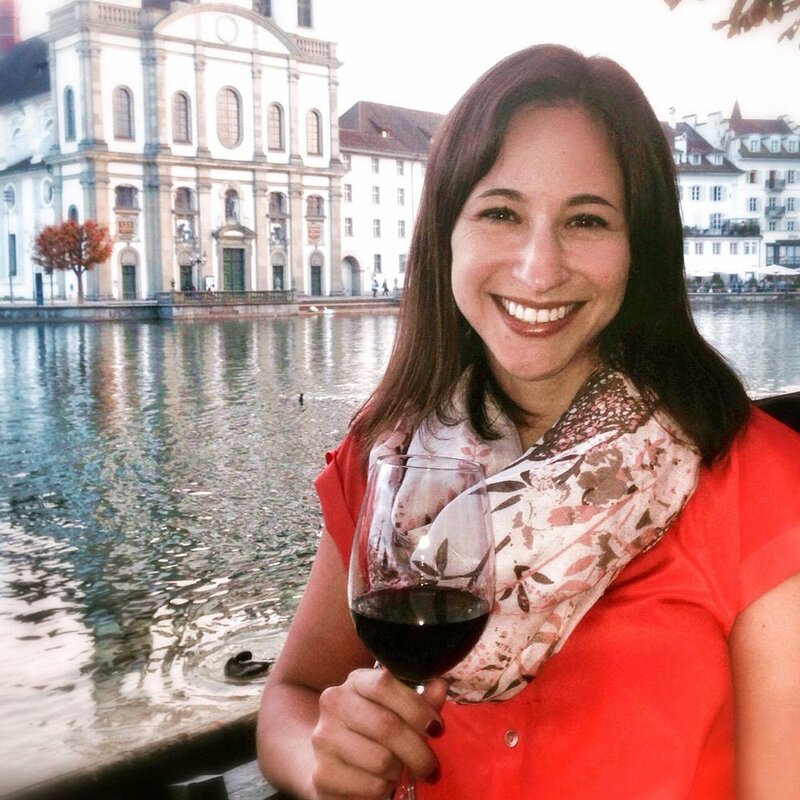 Had we been baby-free, we would have definitely stopped for a post-walk/pre-dinner drink at the glamorous Park Hotel in Vitznau. It's super fancy (and expensive - it's motto is a "health and wealth residence"), but you can't beat the lake-side location and sunset views!